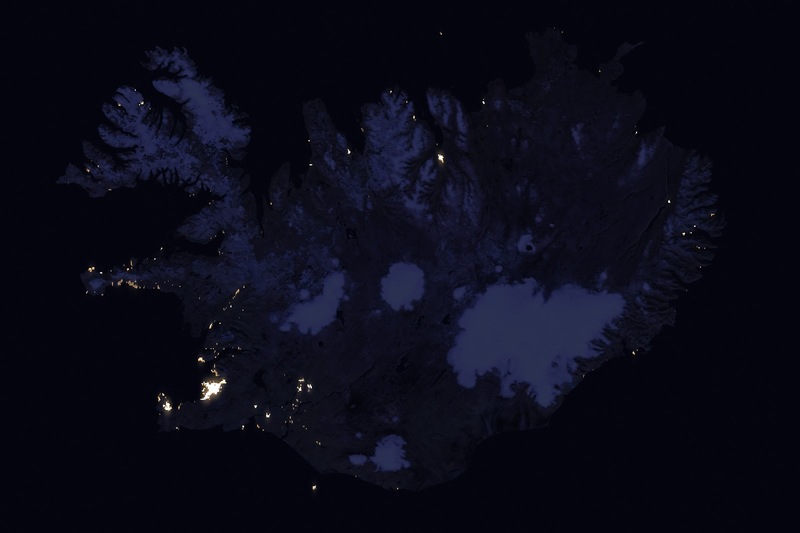 May 12, 2017: By day, satellite images of Iceland highlight the nation’s diverse landscape. Sunlight illuminates the smooth, rounded ice caps and the seasonal snow of the interior areas. Snow-capped ridges mark the glacier-carved coastlines. But the view at night offers an entirely different perspective of the Nordic island nation. This image shows Iceland’s nighttime lights as observed in 2016; it comes from a new global composite map that provides the clearest-yet views of the patterns of human settlements across Earth. The composite was built by selecting the best cloud-free images acquired with the day/night band of the Visible Infrared Imaging Radiometer Suite (VIIRS) on the Suomi NPP satellite. 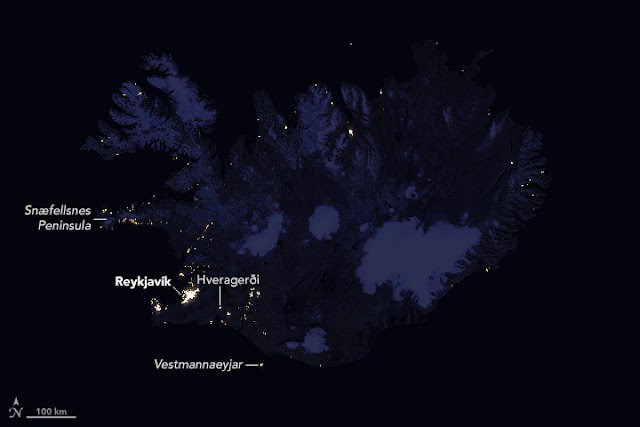 Images of night lights are useful for showing how and where humans populate the planet. In this image, you can see how the Icelandic landscape influences where people live. The island’s interior—the so-called central highlands—is rugged. Compared to coastal areas, the interior is high in elevation, sparsely vegetated, and cold. It is sprinkled with volcanoes, icecaps, and hot springs. People visit the area, but you won’t see many signs of permanent settlement. In contrast, areas closer to the island’s perimeter are well lit. Reykjavík stands out as the large, bright area in the southwest. That makes sense, given that it is the country’s capital and largest city. In 2014, the city’s population was 184,000 people—almost half of Iceland’s population. The other half live in smaller urban areas located primarily near the coast. The coast is not only more hospitable; it provides access to ocean resources, particularly fishing. Some of those fishing villages are found on Snæfellsnes, a peninsula in western Iceland that appears well lit. Lights along the peninsula might also be farms and summer homes, and they appear in relatively high density because of the narrow coastal area. Lights elsewhere could have their roots in agriculture. Towns primarily in the south, such as Flúðir and Hveragerði, make use of geothermal energy to heat greenhouses for growing vegetables and flowers. Artificial lights in these greenhouses can stay on well into the night, particularly during the dark winter months.